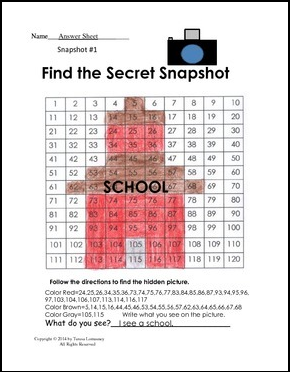 Math Secret Snapshots allow students to practice counting and place value, while having fun finding the secret picture! This picture will help peak the interest of students in math. It can be used for morning work, early finishers, or math centers. This is ideal for differentiated instruction, as well. Students may work on the picture alone or with guided instruction. As such, it is for use in one classroom only.